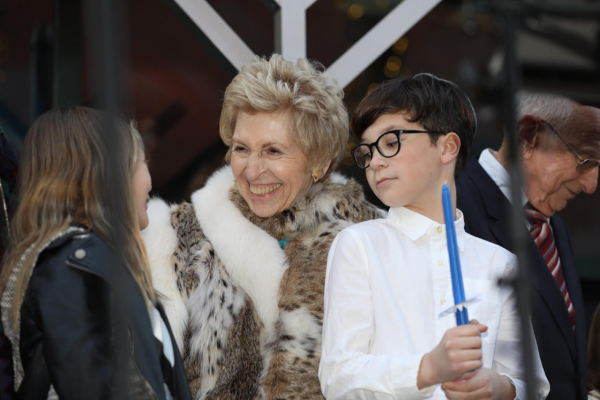 Ildi Good was one of eight Holocaust survivors honored at a public menorah lighting on Sunday at Fashion Island. The celebration began with holiday musical performances by the Tarbut v’Torah day school choir and the musical group Orange Jews. The community honored eight Holocaust survivors during the lighting. Steve Silverstein and Rabbi Mintz stand with eight Holocaust survivors who were honored at a public menorah lighting on Sunday. On Nov. 9 to Nov. 10, 1938, “Kristallnacht”, also called “Night of Broken Glass,” Nazis in Germany torched synagogues, vandalized Jewish homes, schools and businesses and killed close to 100 Jews. After this event, conditions for German Jews grew increasingly worse; Kristallnacht served as a tipping point, a sign that Nazi anti-Semitism was not a temporary predicament and would only intensify. The eight survivors were each introduced to the crowd by Steven Silverstein, who recounted their stories of survival. These accounts included spending time in labor camps, living in ghettos set up by the Nazis, being hidden by good and moral gentiles who themselves might have been killed for doing so, living in holes and scrounging for food for years, and escape under harrowing circumstances, all while not knowing if they would survive the next day. Some were but small children at the time. Each survivor was accompanied onto the stage by a child to light a candle, a literal and figurative passing of the torch, the continuity of their inspiring flames, from one generation to the next. They all participated in lighting the menorah, and then each received a memento of the occasion, a personalized Star of David menorah. 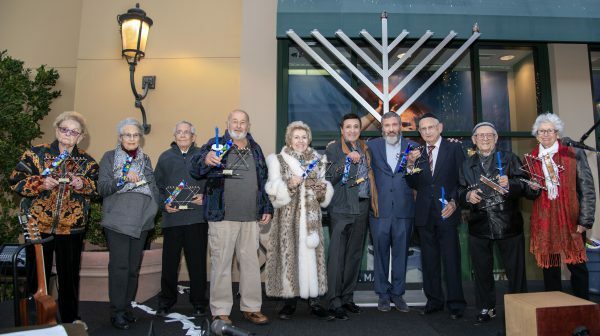 The menorah lighting at Fashion Island began with musical performances by the Tarbut v’Torah day school choir. 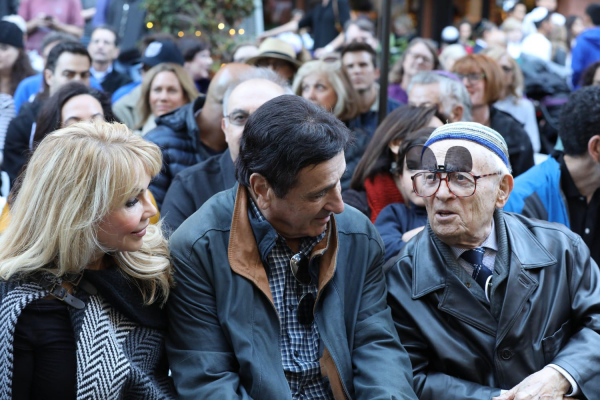 Holocaust survivor Jacob Eisenbach with Steve and Karen Silverstein at a menorah lighting on Sunday.